(CNN) -- Sen. Barack Obama's campaign used a new attack ad Thursday to pound Sen. John McCain for his failure to answer a question about how many homes he owns. Sen. John McCain has faced Democratic criticism that he's out of touch with average Americans. The Democratic candidate hammered home the same point on the campaign trail in Virginia as the McCain camp battled back. "Somebody asked John McCain, 'How many houses do you have?' and he said, 'I'm not sure, I'll have to check with my staff,' " Obama said Thursday in Virginia. "True quote. 'I'm not sure, I'll have to check with my staff.' So they asked his staff and he said, 'At least four.' "
Obama was referring to McCain's comments in an interview for the Politico Web site. "I think -- I'll have my staff get to you," McCain told Politico. "It's condominiums where -- I'll have them get to you." The McCain campaign later told Politico the senator from Arizona and his wife, Cindy, own at least four homes in three states. Other news organizations have reported a higher total. Cindy McCain is heir to a beer fortune estimated at roughly $100 million. McCain faced similar criticism from Obama after remarks Saturday at the Rev. Rick Warren's faith forum in which the Republican joked that someone would need to earn $5 million a year to be defined as rich in the United States. "Now think about that -- I guess if you think that being rich means you gotta make $5 million, and if you don't know how many houses you have, then it's not surprising that you might think the economy is fundamentally strong," Obama said Thursday. "But if you're like me and you've got one house -- or you were like the millions of people who are struggling right now to keep up with their mortgage so that they don't lose their home -- you might have a different perspective." Obama said that there was a "fundamental gap of understanding" between McCain's world and "what people are going through every single day here in America." In response to Obama's attack, McCain's campaign again pressed its case that the senator from Illinois is an elitist. "Does a guy who made more than $4 million last year, just got back from vacation on a private beach in Hawaii and bought his own million-dollar mansion with the help of a convicted felon really want to get into a debate about houses?" McCain spokesman Brian Rogers said. "The reality is that Barack Obama's plans to raise taxes and opposition to producing more energy here at home as gas prices skyrocket show he's completely out of touch with the concerns of average Americans." The Obama campaign released its new ad hours after McCain's Politico comments surfaced, painting a portrait of the Republican senator as privileged and insulated from current economic woes. "Maybe you're struggling just to pay the mortgage on your home. But recently, John McCain said, 'The fundamentals of our economy are strong,' " said the announcer in the 30-second spot. "Hmm," the speaker continues skeptically as the ad flashes a picture of a house with a foreclosure sign in the front yard. "Then again, that same day, when asked how many houses he owns, McCain lost track. He couldn't remember. Well, it's seven. Seven houses," he continues. On-screen, the legend flashes: "It's seven. Worth $13 million." The White House appears on-screen as the announcer concludes: "And here's one house America can't afford to let John McCain move into." 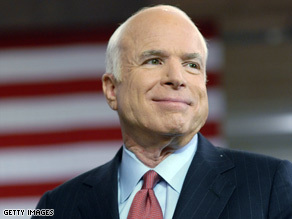 The latest dust-up between the candidates comes as McCain chips away at Obama's lead in a national survey of polls. According to CNN's average of recent national surveys, Obama is ahead of McCain by 1 percentage point, 45 percent to 44 percent. Obama's lead in the "poll of polls," which consists of seven surveys, is down from 3 percentage points on Wednesday and down from 8 percentage points in mid-July. The poll of polls includes NBC/The Wall Street Journal (August 15-18), CBS/The New York Times (August 15-19), Zogby (August 14-16), George Washington University Battleground (August 10-14), Gallup tracking (August 17-19), Los Angeles Times/Bloomberg (August 15-18) and Quinnipiac (August 12-17). The poll of polls does not have a sampling error. CNN's Ed Hornick, Alexander Mooney, Joe Johns, Rebecca Sinderbrand and Alan Silverleib contributed to this report.